China's pollution is bad. It's a huge problem. 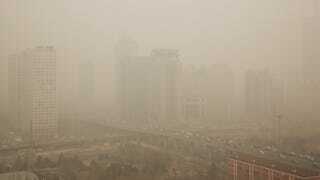 The air quality in Beijing has even been compared to a nuclear winter. But how does that compare to where you live? Website Air Pollution in Asia (via Beijing Cream) tracks China's Air Quality Index in real time—as well as in other locations around the world. Thus, it's possible to compare, say, where you live to China—and, in turn, really put into context just how big of a problem pollution is for the country. There are clearly parts of the country that are less polluted than other parts. But, as Beijing Cream points out, the air quality in Beijing isn't even the worst. Yinchuan apparently hit 999 on the Air Quality Index. Yowzers.